Popular Mechanics has just honored two of our favorite products, Cubify and 123D, giving two spots of the top 10 to 3D printing. Popular Mechanics just came out with their Top 10 Tech Breakthroughs of 2012 awards and picked ten “tech products that matter most.” And wouldn’t you know it, two of the spots went to 3D printing products. Twenty percent, not bad. 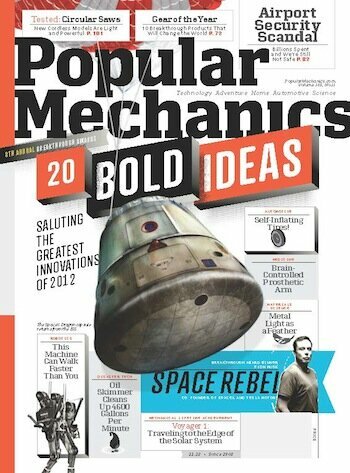 Now I know Popular Mechanics isn’t the magazine most makers these days read, but the makers of my youth sure did. And it’s still a popular read. They selected a 3D printer as one of the winners, and it’s the Cubify Cube from 3D Systems. I won’t argue that it’s the best 3D printer for your money, but it’s certainly the most “home-friendly,” looking like something you would give your children (or yourself) for Christmas, something that would fit in on your kitchen counter next to the toaster. And 3D Systems CEO Abe Reichental has a lot to do with getting the word about this machine, appearing on show after show across the country this year, proudly showing off his new baby. The other 3D printing-related award went to the 3D modeling suite from Autodesk called 123D. In this suite are simple and free tools that give even amateurs and experienced users alike the power to create share and print 3D models. With 123D you easily design and then send your models to any 3D printing service or to your own 3D printer. The 123D Catch program and app will let you “scan” objects by taking 20-30 photos of it, which are then meshed together into a 3D model. While 123D Sculpt and 123D Make are also part of the software suite, they aren’t related to 3D printing. It’s really 123D Catch and 123D that earned the award. Here’s a clip from The Today Show, where Glenn Derene, Senior Editor of Popular Mechanics, stopped by to demonstrate five of the award winners. He begins with Cubify. The other four are quite interesting. 123D wasn’t demonstrated, but software doesn’t make for very good TV.